It was Mzilikazi, the first great leader of the Matabele , who called these bare granite summits the Matobo because to him they resembled a huddle of bald heads. Today these strange, brooding hills are still a holy place, riddled with caves whose walls are covered with prehistoric rock art, and Mzilikazi himself is buried here. No wonder the Matabele still call this Malindidzimu – the Place of Spirits. One of the best views is from Cecil Rhodes’s grave, perched on one of the highest points in the Matobos. From here what you see is a tumbledown landscape cast in granite, with weathered pinnacles and dizzy rock castles looming over deep, boulder-strewn valleys. Leopards are common here, although not easy to see; but you should have better luck if you go rhino-tracking, or spotting sable kudu and tsessebe in the valleys of yellow grass below, as well as klipspringers clattering on tiptoe over the rocks. For birders the main attraction here are the black eagles that circle endlessly over the wind-blown summits. The Matobo Hills are the world’s number one stronghold for these magnificent raptors, with a current population of around 200 breeding pairs. The plusses for this park are it’s magnificent, towering granite ‘whalebacks’ and precarious looking rock stacks, its scenically positioned lakes and the fact that it has the most concentrated collection of San rock paintings in Africa. Cecil Rhodes’ grave is here in a spectacular setting and the whole park is a photographer’s paradise The rocks are home to an astonishing variety of raptors including the largest population of Verreaux’s eagle in the world. On the minus side, although it has the densest concentration of leopard in Africa, they are largely nocturnal and seldom seen; and the Whovi wilderness area which is designated as the game viewing area, is not very wild, not very large and although you’ll be unlucky not to see the resident rhino, black and white, they are almost a bit too predictable. I really love this park which is the second most visited in Zimbabwe but more for the amazing scenery and atmosphere than the wildlife. I felt a strong spiritual presence when visiting the dwalas, or eroded granite kopjes, of the Matopos. Many others, apparently, feel the same; some of the dwalas appear precariously balanced, as if held in place by supernatural forces, and the San bushman art which adorns their caves hint at age-old secrets. Coloured grey, pink, ochre and gold by swathes of lichen, there’s an appealing, sculptural quality to the formations. I scrambled up a couple of them to admire the view of the surrounding bushland, which has been stocked with white rhinos – rangers will take you out on a tracking expedition on request. The park was very quiet when I visited – it was just me, my guide and a couple of soaring eagles – but for me, that only added to the atmosphere. More than just a wonderful scenic spot or a wildlife refuge, Matobo National Park is one of the cultural highlights of Zimbabwe. It should in fact be considered one of the world’s ‘power places’ – right up there alongside Great Zimbabwe Ruins as an African counterpart to Machu Picchu and Angkor Wat! Trek in Matobo and you will see great troops of baboons (perhaps the leopards that feed on them) and some fantastic eagle sightings. But there are also ancient lookouts and fortifications and the storage areas and forges where the warriors of Lobengula once made their fearsome assegais. In this park lie not only the ancient ‘Rain Shrine’ of the Ndebele but also the grave of Cecil Rhodes who asked to be buried here on what he called ‘the view of the world.’ Rhodes was a realist – I guess he figured that if he was going to have to spend eternity in one spot he might as well give himself something interesting to look at! Also referred to as the Matopos, this small national park and UNESCO World Heritage Site was primarily established to protect a section of the Matobo Hills – the unique boulder-strewn landscapes of southern Zimbabwe. Extruded granite has been weathered and eroded over time to form the iconic smooth whalebacks and ubiquitous broken koppies that pepper this park. 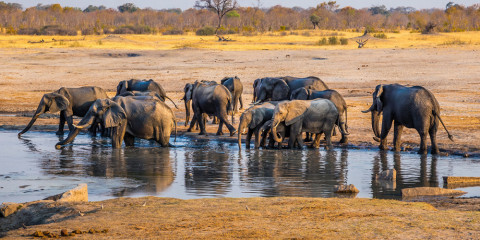 There is no denying that the Matobo Hills exude a powerful wilderness vibe, as well as unusual and arresting scenery, but it’s not a place you would choose to visit on your safari if you want to see large numbers of wild animals. Legions of leopards are said to reside within this prime hilly habitat, but in three visits to the region, I’ve never spotted one. The most memorable aspect the Matobo Hills is not really the wildlife but the stunning landscape of gigantic granite domes and bizarre balancing rock formations. These include the aptly-named ‘View of the World’, where the grave of Cecil John Rhodes (the British imperialist who founded Rhodesia, as Zimbabwe was known prior to independence) stands atop a vast whaleback at the centre of a ring of giant boulders, where wildlife includes colourful agama lizards, twitchy nosed elephant-shrews, and the near-endemic boulder chart. Elsewhere the park contains some superb prehistoric rock art, notably the monochrome animal outlines at White Rhino Shelter and some outstanding figures of running giraffes at Nswatugi Cave. Rhino and giraffe are also likely to be seen in the fenced Whovi Game Area, which can only be entered in a vehicle. Elsewhere, there are no restrictions on walking, and hikers often see klipspringer, rock hyrax, impala and the magnificent black eagle. Matobo means ‘bald heads’, and refers to the unearthly volcanic landscape of balancing stones and granite whalebacks for which this park is famous. Measuring just 420 sq km, it is small enough for a day trip from Bulawayo, Zimbabwe’s second city, though you will need longer to appreciate its unique appeal. Don’t come for big game – there are no lions or elephants – but expect the unexpected: I have seen black mamba, caracal and crowned eagle, all of them elusive anywhere. This is a place to explore on foot, following well-marked trails to caves adorned with ancient rock art. On the way you may well meet wildlife such as hyrax, klipspringer, baboon and Verreaux’s eagle. The big five are represented by white rhino, easily tracked on foot, and leopard, which reputedly occur in unusual densities – although I’ve never spotted one here. Sable, tsessebe, wildebeest and other antelope wander the woodlands and valleys, while a separate fenced game reserve has been restocked with rhino, black and white, plus giraffe, zebra, hippo and other larger species. Cecil Rhodes might have been a dodgy megalomaniac but he did know a good view when he saw one. I never tire of the magnificent slabs of rock and giant boulders, streaked with rainbow lichens and rainbow lizards that surround his grave high up in the Matobo Hills. Rhodes so loved these hills that he gave them to the nation in 1926 as the country’s first national park. Whether they were his to give is a different question! Not all the hills are part of the park, which covers 424 sq km (164 sq miles). Of this, 100 sq km (38.6 sq miles) is set aside as a separate fenced game reserve. 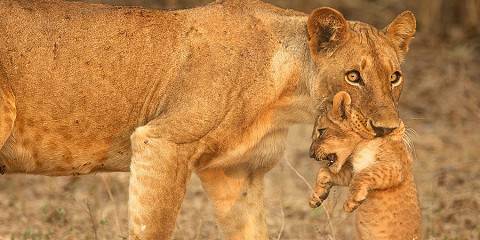 Sadly the number of antelope has dropped due poaching for food, but the park does have excellent collections of both black and white rhino and the world’s highest concentrations of leopard and black eagles (but no lion or elephant). 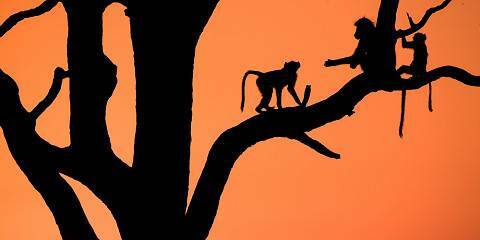 In all it has 88 species of mammal, 175 species of bird, 39 species of snake and 16 species of fish. But in spite of the rhinos and prospect of leopards, my greatest joy of the Matobo lies in the rocky kopjes outside the game reserve. There are many thousands of rock paintings in the caves and shelters across the hills – man has been living, worshipping and decorating here for at least 13,000 years. Add this to the extraordinary sculptural quality of the natural landscape with the windcarved balancing rocks and whaleback granite domes and you have a giant open-air art gallery hundreds of miles in diameter. It’s so spectacular it’s been designated a UNESCO World Heritage site. There are two luxury lodges in the area, Big Cave Camp and Amalinda, where I stayed on my last trip. It’s a magical place wound in and around the rocks with a superb resident archaeologist to take you round the cave paintings. While I’ve always easily seen wildebeest, giraffe, zebra and common species of antelope in Matobo’s wooded valleys, I don’t find this park particularly special in terms of game viewing. There’s a high concentration of leopard, but with no opportunity to do night drives these remain pretty elusive, and elephant and lion aren’t present. But there are exceptions; I’ve never had any problem locating both black and white rhino, (which breed here successfully), baboons and vervet monkeys can be seen scrambling over the rocks, and I find the semi-tame multi-coloured agama lizards in the car parks oddly absorbing. 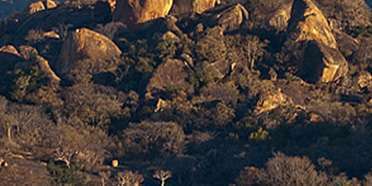 Additionally, Matobo’s numerous San rock paintings are fairly interesting, and the grave of British Imperialist Cecil John Rhodes at World’s View is a good vantage-point to see the park’s distinctive granite balancing rocks. The scenery in Matobo National Park is quite spectacular. The huge granite boulders balanced on top of each other seem to be placed here by some giant life form. These rocks are home to many creatures that love that kind of habitat like the agile klipspringers that jump from rock to rock and the rock hyrax that live between the gaps. Black eagles love nesting on the cliffs and can often be seen circling above. I’ve even seen a leopard basking in the early morning sun on top on such a formation. General wildlife densities aren’t very big, but most common savannah species are present including giraffe and rhino and a variety of antelopes. Several rock-art sites can be visited in the park.